Look closely at a decorated Christmas tree and you might see a pickle-shaped ornament hidden deep within the evergreen branches. According to German folklore, whoever finds the pickle on Christmas morning will have good luck for the following year. At least, that's the story most people know. But the truth behind the pickle ornament (also called a saure gurke or Weihnachtsgurke) is a little more complicated. Ask a German about the custom of Weihnachtsgurke and you may get a blank look because in Germany, there is no such tradition. In fact, a survey conducted in 2016 revealed more than 90 percent of Germans asked had never heard of the Christmas pickle. So how did this supposedly "German" tradition come to be celebrated in the U.S.? Much of the evidence for the historical origins of the Christmas pickle is anecdotal in nature. One popular explanation links the tradition to a German-born Union soldier named John Lower who was captured and imprisoned at the notorious Confederate prison in Andersonville, Georgia. The soldier, in ill health and hungry, begged his captors for food. A guard, taking pity on the man, gave him a pickle. Lower survived his captivity and after the war began the tradition of hiding a pickle in his Christmas tree in remembrance of his ordeal. However, this story cannot be authenticated. The holiday tradition of decorating a Christmas tree did not become commonplace until the last decades of the 19th century. Indeed, observing Christmas as a holiday was not widespread until the Civil War. Prior to that, celebrating the day was largely confined to wealthier English and German immigrants, who observed customs from their native lands. But during and after the Civil War, as the nation expanded and once-isolated communities of Americans began mixing more frequently, observing Christmas as a time of remembrance, family, and faith became more common. In the 1880s, F.W. Woolworth's, a pioneer in merchandising and the forerunner of today's large drugstore chains, began selling Christmas ornaments, some of which were imported from Germany. It's possible that pickle-shaped ornaments were among those sold, as you'll see in the following story. 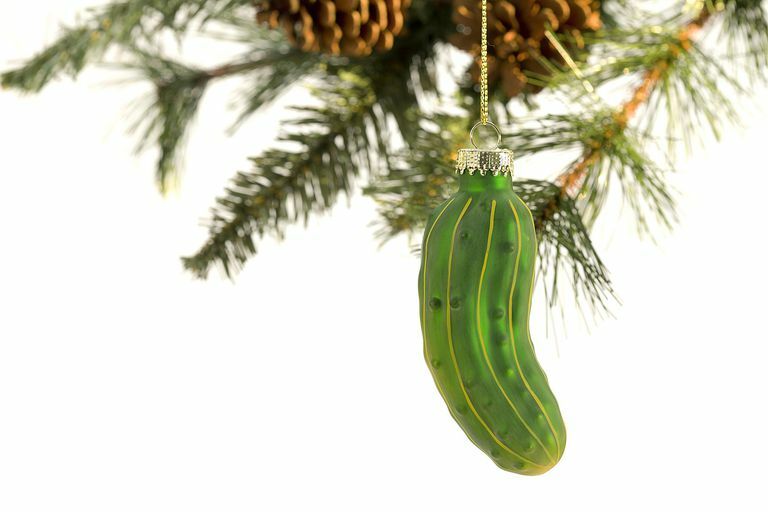 There is a tenuous German connection to the glass pickle ornament. As early as 1597, the small town of Lauscha, now in the German state of Thuringia, was known for its glass-blowing industry. The small industry of glass-blowers produced drinking glasses and glass containers. In 1847 a few of the Lauscha craftsmen began producing glass ornaments (Glasschmuck) in the shape of fruits and nuts. These were made in a unique hand-blown process combined with molds (formgeblasener Christbaumschmuck), allowing the ornaments to be produced in large quantities. Soon these unique Christmas ornaments were being exported to other parts of Europe, as well as England and the United States of America. Today, a number of glass makers in Lauscha and elsewhere in Germany sell pickle-shaped ornaments.